The Kathmandu Coast to Coast is full for the first time in a decade with the women’s World Championship Longest Day event shaping up as a titanic battle with defending champion Elina Ussher poised for a record equalling five wins. Ussher will have to face a number of strong women including late entry, two time champion and three-time adventure racing world champion Sophie Hart. The 34 year old Lyttelton GP last raced in the event in 2013, winning. Her first win in 2011 in a time of 12 hours 10 minutes was only one minute outside the women's individual record of set by Christchurch's Andrea Murray in 1997. The women’s field is the strongest in years led by four time winner Ussher, last year’s runner up South African Robyn Owen who was leading the race into the final bike leg before being over hauled by Ussher, Christchurch based German Simone Maier who last raced in the event in in 2015 when she was second, Whakatane’s Corrine O'Donnell, a strong runner who always makes her presence felt, 2016 women’s two day winner Anna Barret and Hart. Former world champion kayaker and Olympian Teneal Hatton is another one to watch in the women’s one day event. Hatton was third in Novembers ICF ocean ski world champs in Hong Kong racing as the event’s defending world champion. The 2014 K1 1000m world kayak champion caused a major shock when she defeated double world champion Lisa Carrington in December 2015 in the K1 500m at Canoe Racing New Zealand's Blue Lakes regatta. She won a World champs gold medal in 2013 and 2014 and was controversially not selected for the Rio Olympics. Hatton, who was fifteenth in the K1 500m at the 2012 London Olympics now works full time as a paramedic and has racked up a number of adventure races while still not ruling out a bid to make the Tokyo Olympics. Ussher’s build up to her thirteenth consecutive Coast to Coast has been slightly different to previous years as she and her husband, five time winner and Event Race Director Richard, have purchased an adventure park near Nelson resulting in a busier build up. Ussher welcomed the strong women’s field saying it provides extra motivation to race well and is good for the Kathmandu Coast to Coast and multisport. If the 41 year old Nelson endurance athlete wins on Saturday she will equal multisport legend Kathy Lynch’s women’s race record of five wins. Owen is hoping to put learnings from last years’ first taste of the event to good use on Saturday where her lack of road cycling cost her the win. “I've done more training on the bike this time, possibly still not enough as the roads aren't my favourite place,” Owen said. Owen, who will be joined by her brother Lance Kime in the one day race this year, says New Zealand is known as the world hub of multisport and adventure racing and believes the depth of talent, particularly the female athletes, is more than can be found anywhere else in the world. Leading Australian multi-sport athletes Alex Hunt and James Pretto and Kiwi Bobby Dean loom as men’s defending World Championship Longest Day champion Sam Clark’s biggest challenges. Clark stormed home last year to pass Braden Currie on the final bike leg to claim back to back wins in the World Championship longest day event. Dean has raced for top adventure racing team Team Bivouac inov-8 and was eleventh in the 2016 Kathmandu Coast to Coast and fourth last year while Hunt is back for his third crack at his favourite event and is aiming to repeat his 2016 podium effort. “I’m feeling good and I have learned the importance of having a proper taper and avoiding any last minute stresses during race week,” Clark said. 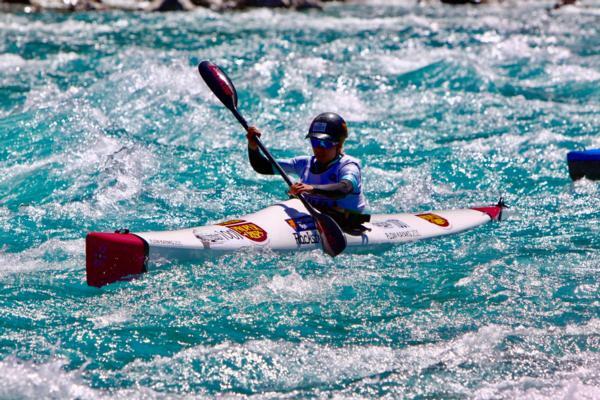 26 year old Kime is much like his sister Robyn, having raced professionally as a river paddler in South Africa most notably winning South Africa’s biggest kayak race the Dusi Canoe Marathon in 2013 and 2016. He should have a strong kayak leg, possibly even the fastest time, although says knows the kayak leg is secondary to being able to string together a consistent race over the whole day in his first taste of the event. A one day wild card who could feature is 50 year old adventure racing and multisport legend Ian Edmond who last entered the event in 1995 when he won. Edmond has raced all over the world in an adventure racing and multisport career that has spanned over 20 years and covered most continents. Edmond could push some of the top contenders and even make the top 10 of the event. The Kathmandu Coast to Coast starts on Serpentine Beach south of Greymouth at 7am on Friday with the World Championship Longest Day event getting underway on Saturday morning at 6am.